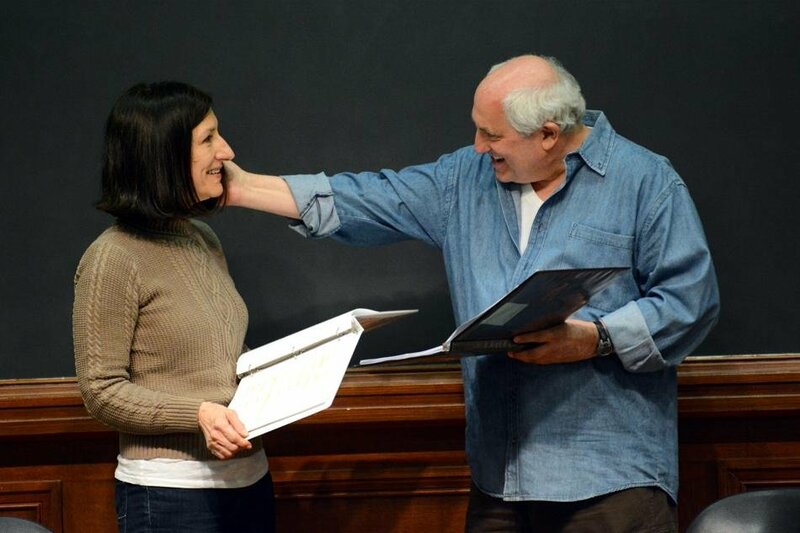 Julie Proudfoot and Frederic Stone perform in a staged reading of The Lake on campus Monday evening. The event was in conjunction with programming for Sexual Assault Awareness Week. Take Back the Night hosted Monday a staged reading of “The Lake,” a play which explores the conflicts surrounding domestic violence. The event, held in Harris Hall, drew a crowd of about 20 and included the play and an open panel discussion. It marked the first night of Sexual Assault Awareness Week, which will end Saturday night and include an organized march around campus Thursday evening. The three-character play, which lasted just over an hour, was produced by Artemesia Theatre, a Chicago-based theater company whose mission is to produce entertainment that challenges society’s view of women. “The Lake” centers around a father, mother and daughter who are trying to cope with the consequences of domestic violence on the family. The production, loosely based on Proudfoot’s own childhood, switches between a bleak present and a violent past. In the former, the mother and the daughter must manage repercussions of the father’s death. The latter gradually explains how violence, alcohol and bitterness tore the family apart. After the play’s conclusion, Lizz Bohl, co-chair of Take Back the Night, facilitated an audience discussion. A deep conversation on women’s roles in society and the intricacies of domestic violence followed. The director of the play, Barbara Zahora, also helped facilitate the discussion and talked about her experience as a domestic violence counselor. The were not many Northwestern students in the audience, which mostly consisted of older women. Weinberg freshman Callie Corcoran said it was good to get strong opinions from individuals outside of NU, especially from adults. Linda Walker, 53, gave her opinions on the issues as an adult not affiliated with NU. Ultimately, Zahora said, the purpose of the production was to make people question the causes and effects of domestic violence and to comprehend the issue’s complexity. She said when she debuted the play, people asked her why the victims didn’t just leave.